Classic Car Center of Fredericksburg, Inc.
And, of course, the 190 SLs are, after the 300 SLs, the most collectable post-war Mercedes sports cars. For a more complete description, a video and 40+ pictures, click on the picture above. All of us here at the Classic Car Center have a passionate belief that collector cars should be a pleasure to own and enjoy. Our state of the art facility provides everything the enthusiast could wish for, all under one roof. 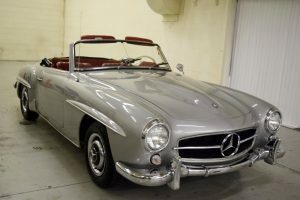 In addition to secure, climate controlled storage, the Center offers general maintenance and restoration services as well as the sale of classic and special interest autos. Minutes from I-95 in historic Fredericksburg, Virginia, the Center is convenient to both the Washington, DC and Richmond metro areas. The relaxed setting is only minutes from the VRE Commuter Rail and is also served by two regional airports. As a customer, you will enjoy a host of specialized services tailored to having you driving more and worrying less. At the Classic Car Center, we treat our customers well and the cars even better! One call does it all! We invite everyone from casual car buffs to the serious collector to re-live the good old days with a call or visit to our facility. Our customer’s lounge, modeled after a 1950’s diner, always has hot coffee, snacks and current collector car magazines. Come by with your friends, relax and enjoy yourself! !